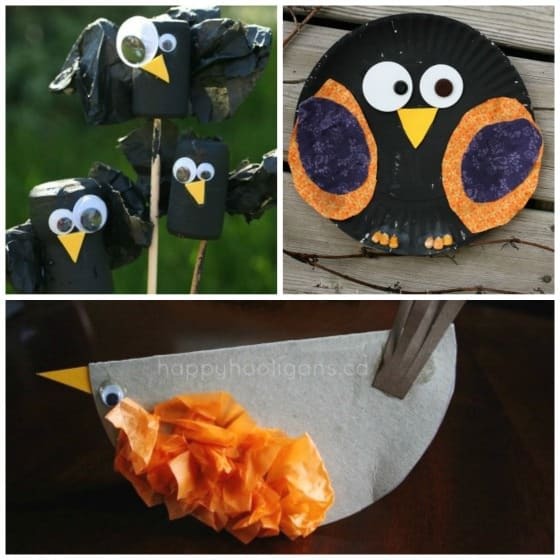 Here’s a huge collection of cute and easy bird crafts for kids to make, using common supplies and materials you already have around your home. Bird crafts are always so fun and easy to make! 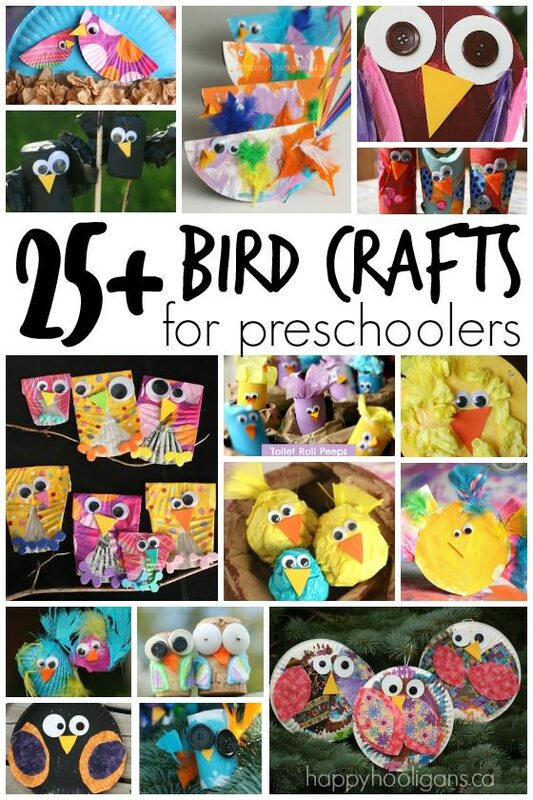 Robins, owls, chicks, turkeys, crows… we’ve made a ton of birds here in my daycare over the years. We’ve also made a ton of homemade bird-feeders too, so be sure to check those out before you leave! One of the reasons I love a bird craft is because you can make a bird out of the most ordinary objects. As long as you have eyes, a beak and some wings or even just a few feathers, you can make almost anything look like a bird. 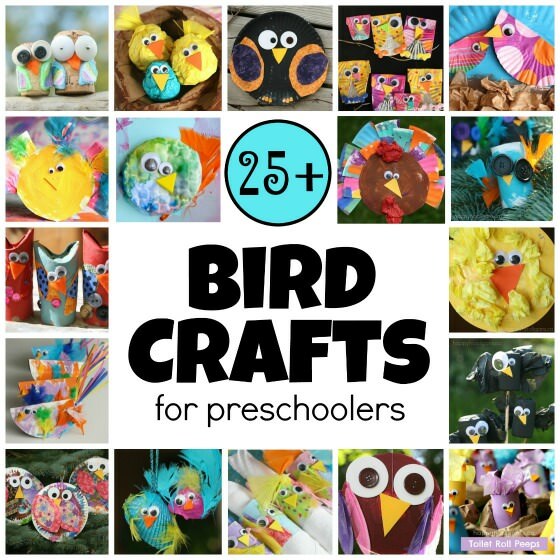 I’ve rounded up over 25 of my favourite bird crafts for kids to make, and I’m putting them all here in one place for whenever you need a quick and easy craft to do with your tots. Whatever the reason or the season, you’ll find a bird here that’s just right for you and your little crafter. We’ve got birds for Halloween, Thanksgiving, Easter and even some adorable bird ornaments for the Christmas tree. 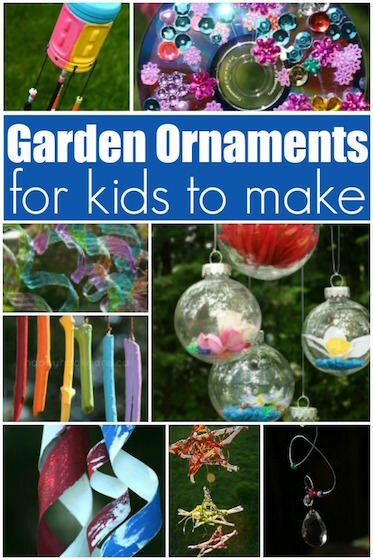 Feel free to use these craft ideas at home, playgroup, daycare or in your classrooms. Just click on the underlined links below the images to see the details for each craft. 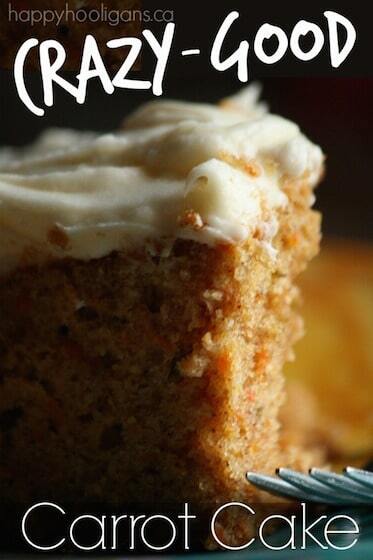 And don’t forget to pin this post! That way, you’ll have it handy when you need it. 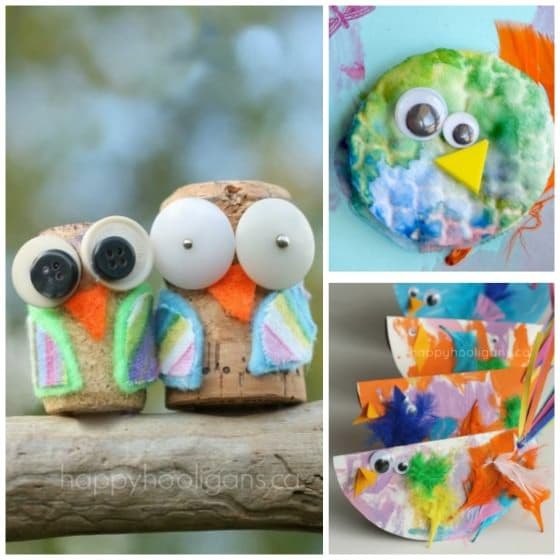 See how me made these adorable Toilet Roll Owls using cardboard tubes, buttons and fabric scraps. 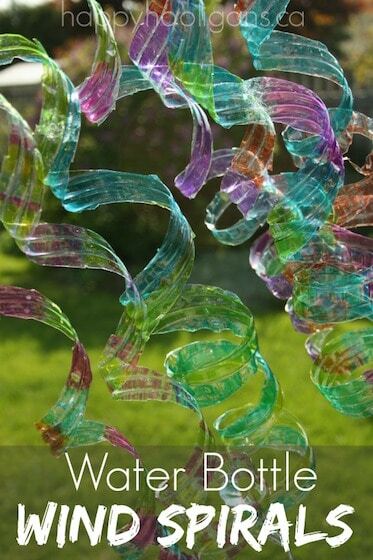 What can you make with a scratched or worn-out CD? This sweet, little CD owl ornament to hang in a window or on your Christmas tree. We used these cupcake liner owls for a skip counting game, but you could use them as gift-toppers or on the front of a homemade card. 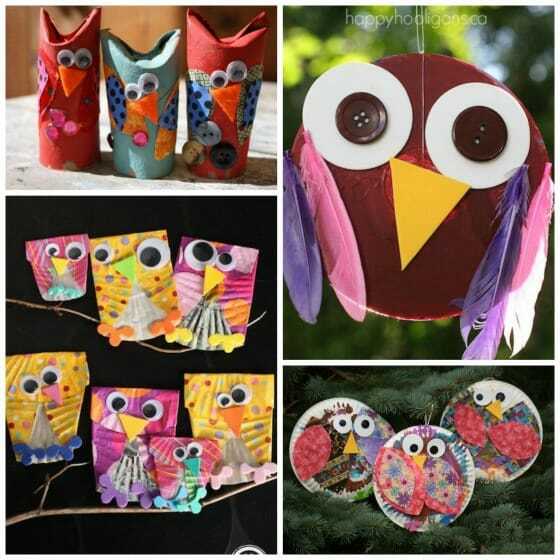 This paper plate owl is perfect for a Letter “O” craft, and your kids will love exploring your fabric scraps while searching for the perfect wings. The big, button-eyes and the colours we chose for these toilet roll crows give them a rather spooky appearance. Perfect for Halloween! Our little pom pom blue jay is one in a set of four Easter finger puppets that I make for the hooligans every year. Have your kids turn a few seashells into these quirky, little bird ornaments for the Christmas tree. You can hang them at home or give them as gifts. Once again, an old, scratched CD is perfect for crafting with. This time, the preschoolers painted them yellow, and transformed them into these chick ornaments for Easter. 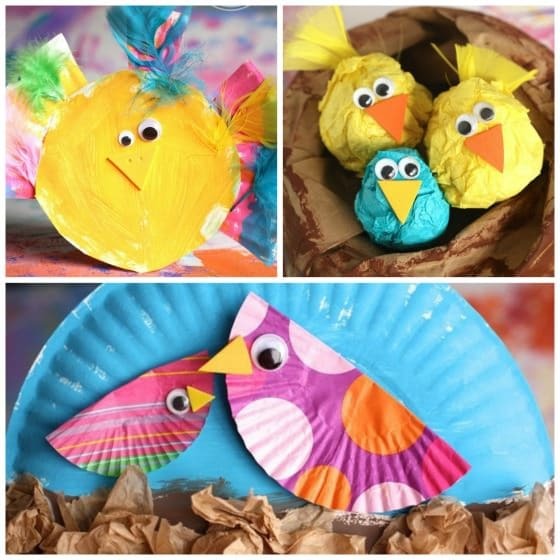 Your kids can make a set of colourful spring chick napkin rings with a cardboard roll and some scraps of cheery fabric. Marshmallow PEEPS were the inspiration behind these pastel-coloured toilet roll chicks. Thinking about it now, we should have finished with a coat of glitter so it would look like our peeps were sugar-coated. 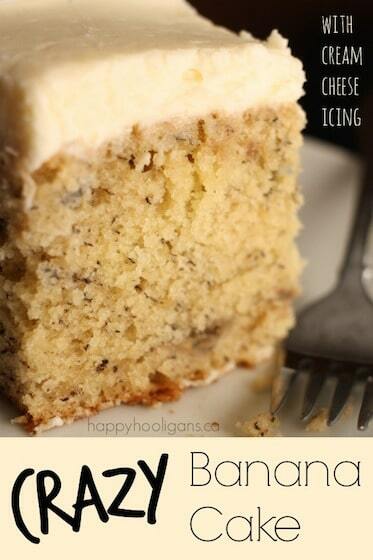 Must put that on the to-do list for next spring! The kids and I made these goofy, little cork crows the other day on a whim. We’re using ours as Halloween decorations at the moment. They’re pretty cute, aren’t they? Here’s another cute crow craft. We made this guy from a paper plate, and similar to when we made our paper plate owls, the kids loved digging through our tub of fabric scraps to choose the colours for their wings. Check out the talons. Hee hee! Every year, a mama robin builds a nest on our back deck. She lays her eggs, and once they’ve hatched, we watch the babies grow and develop until they become fledglings and leave the nest. You can read about it, and see the pictures of our baby robins here. A rockin’ robin is perfect to go along with any lessons about robins in springtime. These wine cork owls are just too cute! I made them a couple of years ago when one of my toddlers was absolutely crazy for owls. 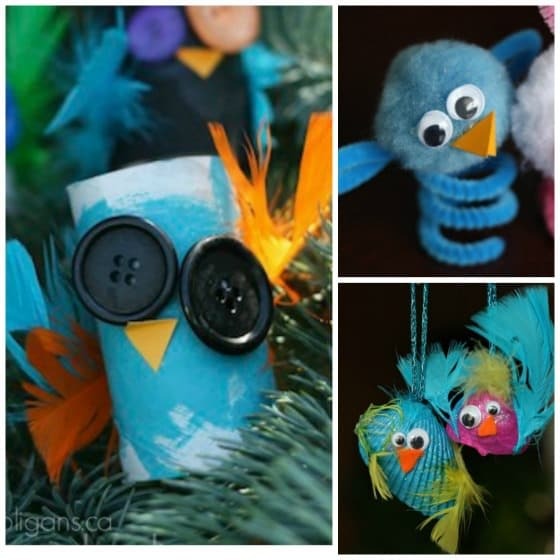 You could hot-glue a loop or ribbon to the top of each owl, and turn them into Christmas tree ornaments. We made these cotton pad chicks when we were experimenting with water absorption one day. The preschoolers dripped coloured water onto absorbent make-up pads. When they dried, we turned them into chicks, and glued them onto homemade Easter cards. The kids chose bright, cheerful colours for these paper plate birds, making them perfect to set out on our Easter dinner table. Similar to our rockin’ robins, colourful birds really do rock. 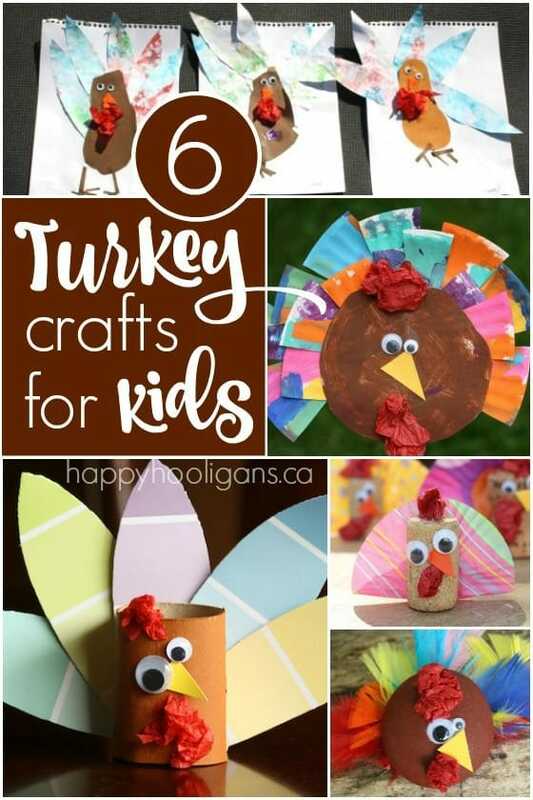 Here are 6 super-cute and easy turkey crafts for your kids to make! Perfect timing as the American Thanksgiving is just around the corner! I love the process that we used to make this paper plate chick. You paint the rim in a variety of colours, and then chop it all up for the “feathers”. Great scissor practice for the preschoolers with this craft. 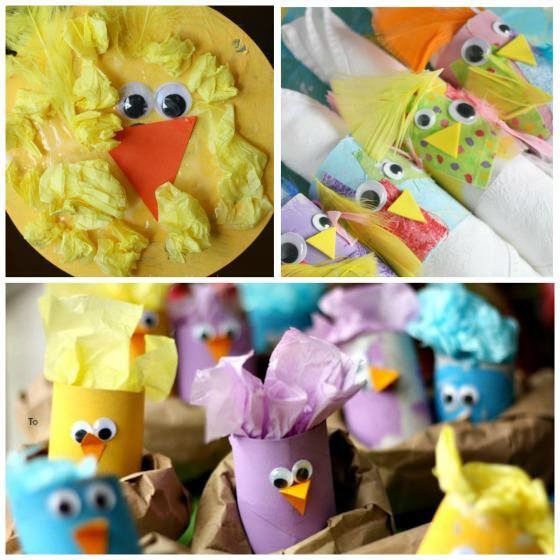 These tissue paper chicks in a paper bag nest are fun and easy for little hands to make. Who knew a crumpled up piece of tissue paper would make the perfect Easter chick? And lastly, one more easy paper plate craft. I love this colourful mama and baby bird. We made them with cupcake liners, and tucked them into a tissue paper “nest”.